Following yesterday's revealing extended TV spot for Captain America: The Winter Soldier, one more new character poster has popped up, and we imagine this will be the last one. This time it's the title villain in the Marvel sequel getting his own poster, and while some may not know the history of The Winter Soldier, all you have to do is know that Sebastian Stan plays the villain, and figure out what other key role that actor might have had in the Marvel cinematic universe to see why this villain will really impact Steve Rogers (Chris Evans). He certainly looks like a force to be reckoned with, especially with that sniper rifle. I want to see Modok, but since we're getting Strucker rather than Zemo I don't think that's going to happen. I don't think characters like Modok will be possible until after GOTG is successful. A floating head with tiny arms could be quite laughable if not handled carefully. That kinda looks like that Bucky guy from the first film. This is satire, right? Please tell me that you aren't actually this stupid. 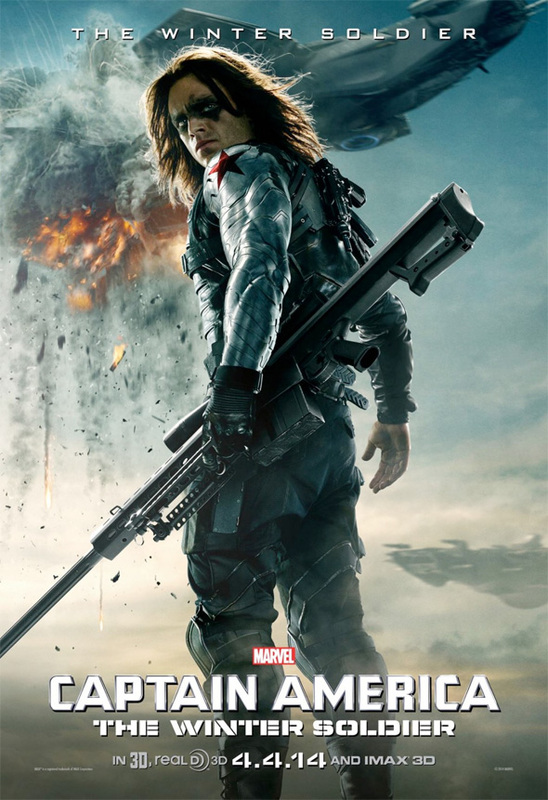 It looks like he shot down that helicarrier with only a sniper rifle. Not excited for anything marvel anymore. Mostly cause of how umimpressed I've been with every movie thats come out after The Avengers. Iron Man 3 was pretty bad and Thor 2 was such a big let down for me. The first Captain America was so boring... the villain had no depth whatsoever and every time it would switch back to anything HYDRA I would instantly disconnect. I will admit that the trailer looks solid but... don't they all? I mostly agree with you apart from Captain America. I really like what they're doing with this character as far as aesthetic feel of the film and realism. Chris Evans does an amazing job at portraying Captain America as he is supposed to be portrayed- like a badass, just like the comic. He doesnt force any cheesy out of context one-liners or dialogue that takes away from the integrity of the character. Only a serious tone for the role, which is what i personally dig the most. I agree with you 100% on the way they've dealt with Captain America's character but everything around it in the last film was just so meh. Well you have to remember it was an origin story. Im sure you'll have all the elements come together in this next film. I can't wait for this movie to just come out so we don't have to see any more damn promos! Ugh we get it its another Marvel movie blah blah blah. Chris Evans can't carry a movie on his shoulders...he looks so awkward and uncomfortable when he's on screen.